Blood & Treasure: "just shoot"
On September 27, in Mandalay, monks started their peaceful protests and marched towards 42nd street in Mandalay. Light Battalion 33 soldiers kindly requested the monks to not go on and to turn around. It was said that the monks refused and proclaimed "If you must shoot, just shoot, but we are going to go on". When the monks refused to budge, the soldiers from Light Battalion 33 were said to have put their guns down, kneel down to pay respects to the monks and cried while repeating the request to stop. In the end, witnesses in Mandalay reported that the soldiers let the monks go past and the bystanders vehemently cheered on this act of restraint. This may be one of those stories that needed to be told rather than an account of something that actually happened, but Irrawaddy net is reporting infighting between junta head Than Shwe and immediate subordinates over the crackdown. It adds that the Karen National Union has called on other former ethnic insurgent groups to mobilize in support of the demonstrators. Irrawaddy’s still just about available, by the way, but it takes a dog’s age to load. Meanwhile, the big monk roundup continues, though it’s apparently meeting resistance. Lastly, this chap is apparently the commander of Battalion 77 of the Burmese army, responsible for ordering an attack on demonstrators yesterday near Shwe Dagon pagoda. 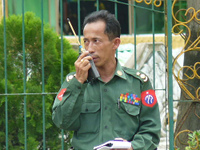 DVB actually has witness accounts that the Battalion 33 stood down without harming the monks. DVB's accounts are usually accurate, so I wouldn't actually doubt them. I have several other accounts of other battalions fighting amongst themselves but I cannot confirm them. Thank Shwe is also preparing to sack the Colonel of Battalion 33 and another Colonel who is refusing to carry out orders to shoot peaceful protesters.